English speakers across the globe are getting a real-time glimpse of what it is like to live under the constant threat of terrorist rocket attacks thanks to a hugely popular smartphone app that sends out a "red alert" whenever Israel is targeted. As Israeli citizens struggle to shelter themselves from a near-constant barrage of rockets fired by the terror group Hamas, those living outside of the Jewish state are experiencing the same sense of panic via the Red Alert: Israel app, which "provides real time alerts every time a terrorist fires rockets, mortars, or missiles into the State of Israel." The iPhone app has received nearly 800,000 downloads since recent hostilities broke out and recently got some unlikely media attention when the siren went off as Israeli Ambassador Ron Dermer was conducting an interview on CBS News. While a Hebrew version of the application has existed for some time—and saved many Israeli lives during times of attack—the idea for an English companion sprouted in an unlikely place: the idea for an English companion sprouted from an unlikely place: a Member of the House Foreign Affairs Committee, Rep. Mark Meadows (R., N.C.). "I was in a meeting with [Dermer] a few months back and his alarm on his phone kept going off," Meadows recalled during an interview with the Washington Free Beacon. Meadows was immediately intrigued and recalled being shocked by the number of times the siren buzzed during his meeting with Dermer. "It was early morning and it had gone off 42 times," he recalled. "And this was in a period of calm, it went off 42 times. I said, ‘I’d love to have that app.’"
The problem? The app was only available in Hebrew. Forty-two "rockets had gone in and no one had covered it," Meadows said. 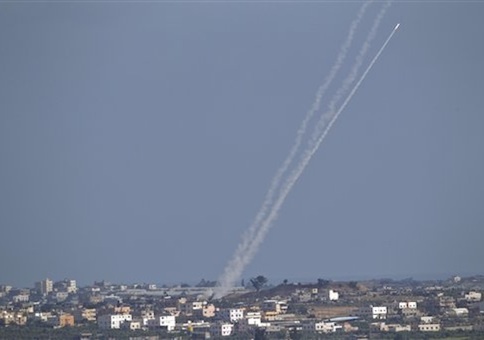 "It was not making news, but here was a barrage of missiles going into Israel. I felt like from an awareness point of view it was important for us to do that." Meadows proposed—and even offered to pay for—the creation of an English language version that ultimately became the Red Alert app. "Nothing can give you a full sense of what it is like to live under the constant threat of rocket fire with the air raid sirens going off every few minutes. But this app can give you some sense of the threats Israelis are facing," Dermer told the Free Beacon. "When it goes off, you can remember that millions of Israelis are under fire, the elderly struggling to get to cover in time, and scared children in bomb shelters," he said. Following the meeting with Meadows, staffers at the Israeli Embassy in Washington, D.C., reached out to the Israeli developers of the original warning system. They quickly got to work on the English app, which initially received tepid support from American consumers. However, once hostilities between Israel and Hamas broke out several weeks ago, the app quickly racked up thousands of downloads from those seeking to get insight into Hamas’ war on Israeli citizens. "I downloaded this app yesterday because I wanted a clearer understanding of what it is like to try to live a normal life and suddenly get an air raid alert, to have to find immediate shelter," wrote one user in a review slugged, "A reminder of reality." "I am in the U.S. and have girly and friends in Israel, living with this," the user wrote. "I find it's very mind-opening to get these alerts, and the frequency and timing of the rockets is mind blowing." Numerous others expressed similar thoughts. "I feel immense sadness when I hear the alarm. But I realized I could do much more than cry, because the alarm is a reminder to pray!!" wrote another user. "When you hear the alarm, PRAY immediately for the protection and safety of the group(s) that are under attack at that moment." Kobi Snir, the apps co-creator, told the Free Beacon via a translator that the app has helped unite Israelis and build solidarity. The initial idea for the warning system came from a 13-year-old Israeli boy living in the southern city of Be’er Sheva, which, like much of Israel’s southern region, is consistently under threat from rocket attacks. "He was worried that in certain places people couldn’t hear the sirens very well so he wanted to develop an app to help them hear the sirens," Snir said. "The situation in the south always upset me despite the fact that I live in the north and of course I couldn’t turn down a 13-year-old the help." While Israelis have learned to live with the constant warnings—which go off even in supposed periods of calm with Hamas and other terror groups—users of the English app have expressed shock at just how often Israelis are forced to seek cover from rockets. An Android version of the warning system called "Israel Under Fire" has received 10,000 to 50,000 downloads, according to Google’s online store. "Really just a few weeks ago we had it translated from Hebrew to English, and it has gone off so many times now on my phone," said Meadows. "It is a constant reminder that we live in a peaceful country here and Israel does not." Warning sirens have even begun to wake Meadows up in the middle of the night. "It’s gone off so many times I had to put my phone on vibrate the other day," he said. "On Saturday morning at 5:14 a.m. it vibrated so much and when I looked it, it let me know there was a series of missiles going in," he recalled. "When I was sleeping peacefully in my bed, folks seven hours away from us, from a time zone perspective, they were having to seek refuge," Meadows said. "It’s made me acutely aware on an hour by hour minute by minute basis of what’s going on." Interest in the app is even growing on Capitol Hill, Meadows said. "Hopefully one day soon a number of members of Congress across both ideological perspectives will have it as a reminder of where we need to be in terms of our support of Israel," he said.